Home / Archive by categoryproduct"
After much playing I decided to go with one of the Selmer C*s. Go figure; what I originally did not like ended up being the one I picked! I recorded myself playing on the various mouthpieces and it still amazes me how different something sounds from a distance verses up close. I guess the more you practice in an enclosed space, the more you get used to hearing yourself a certain way. I definitely need to record myself more often! What I liked about the C* was the diversity of color I could get. I’m excited to share that I finally own a saxophone of my own (Yamaha 875EX Custom Alto Sax) and am looking forward to bringing my sax chops back to the forefront. Special thanks goes to my mother who graciously assisted in this major purchase. I’m very happy with this horn and am looking forward to future events with Jethro (looking at you A Christmas Story and Addams Family)! 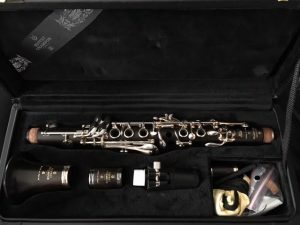 I started playing Eb clarinet my last year at Central Washington University. I performed in a chamber ensemble for Michael Daugherty’s Dead Elvis, which featured the bassoon in an Elvis costume. I don’t have a recording of that performance, but if you have not heard the piece before you can watch this fun recording of the piece.